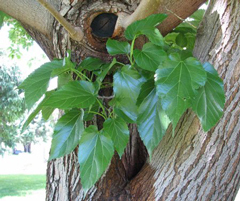 Growth habit Tree has a round habit as a young tree becoming very broad and spreading as it matures. 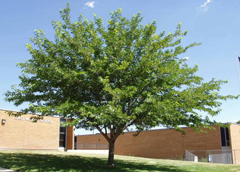 An excellent choice for school grounds and parks where there is plenty of room to spread out. Foliage Bright green lustrous leaves create a dense shade. Fall foliage color can be yellow but is not particularly showy. Flowers This is a male selection and the flowers are insignificant. Fruit Because this tree is a male it has no seeds. Twigs On one year-old branches the bark is a light green turning light gray in couple years and gray-brown with maturity. 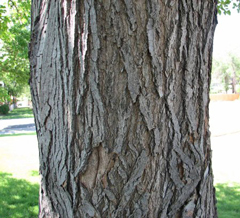 Landscape value Mulberry is usually very tolerant of soil type, alkalinity and droughty conditions. Establishes easily and for the most part is a problem free tree. The growth habit is very dense so it needs to be pruned on a regular basis to avoid internal shading of branches. This internal shading will kill small branches giving the tree an untidy appearance. In the summer of 2002 when all of Colorado was experiencing a severe drought, well-established fruitless mulberry showed no ill effects.